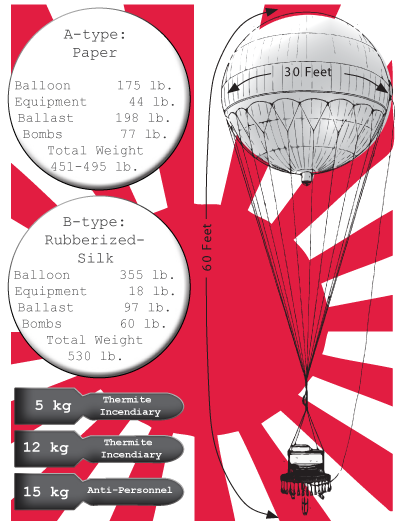 The Japanese military launched nearly 9,300 balloon bombs to attack the United States during World War II. Launched from three primary sites on the east coast of Japan the balloons followed the strong wind currents to reach North America. Documented military accounts from November 1944 to July 1945 counted 285 positive sightings either on the ground or in the air. The technology placed inside these weapons allowed them to regulate their altitude between 30,000-40,000 ft. and release their weapons after a period of time. The only casualties on mainland United States during World War II were caused when an Oregon church group investigated a downed balloon while on a picnic, setting off the device. Disclaimer: This is a demonstration based off the work of Robert C. Mikesh’s research and geocoded to the best available data. Community involvement is encouraged. Not every point has been mapped or accuracy guaranteed. Source: Mikesh, Robert C., Japan’s World War II Balloon Bomb Attacks on North America, Smithsonian Annals of Flight, No. 9, 1973.